WASHINGTON, D.C. -- More than two-thirds of Americans, 68%, say they are paying "very" or "somewhat" close attention to Russia's involvement in the situation in Ukraine. 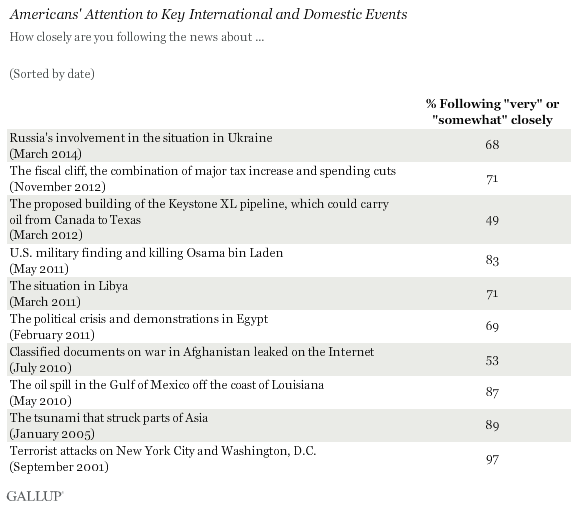 This is somewhat higher than the 61% of Americans who have paid close attention to key news events Gallup has asked about over the past two decades, but about in line with the level of attention paid to other recent international events, such as the political crisis in Egypt in 2011. These data, collected March 6-9, as Russian forces continued to control several Ukrainian military sites, suggest that these events have generated above-average attention from most Americans, compared with other news events Gallup has asked about since 1991. Attention to the crisis in Ukraine is on par with the attention paid to such events as the crises in Egypt in February 2011 (69% paying close attention) and Libya in March 2011 (71%) but below attention to the killing of Osama bin Laden (83%) or the BP oil spill in the Gulf of Mexico (87%). By comparison, the events in Gallup's database that garnered the highest levels of attention were the 9/11 terrorist attacks, Hurricane Katrina, and the beginning of the war with Iraq in 2003, all of which at least 95% of Americans were following closely. 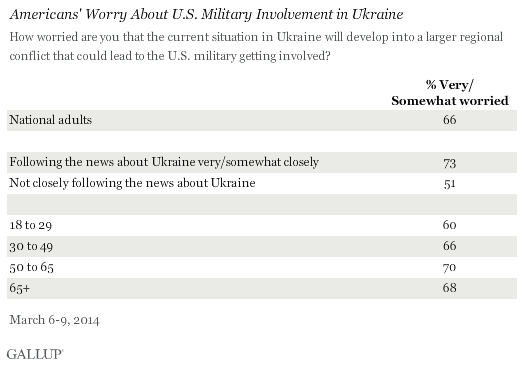 Older Americans report paying more attention than younger Americans to Russia's involvement in the situation in Ukraine. Eighty-two percent of those 65 or older report they are paying "very" or "somewhat" close attention, compared with 49% of those aged 18 to 29. The size of the generational gap in attention paid to the situation in Ukraine is approximately the same as it has been for other recent international events, suggesting that this gap likely reflects younger Americans' relative indifference toward international events, rather than older generations' memory of Russian aggression during the Cold War. Two-thirds of Americans report they are "very" or "somewhat" worried that the current political crisis in Ukraine could develop into a larger regional conflict, leading to U.S. military action. Those who report they are following the news about the crisis closely are more likely to say they are worried than those who are not following the news closely. Younger adults are slightly less likely to be worried than those who are older. As interim Ukrainian Prime Minister Arseniy Yatsenyuk plans to travel to the U.S. to meet with President Barack Obama this week, and as Crimea prepares for a referendum on whether to join Russia, Americans are paying more attention to news of the crisis in that country than they have, on average, for major news stories in recent decades. Additionally, the majority of Americans are at least somewhat concerned over the prospect that the U.S. military may become involved in the region as a result of the situation. As Gallup has previously reported, Americans' favorability ratings of Russia and its president, Vladimir Putin, have recently dropped to record lows. If Russia's aggression toward Ukraine continues, Americans' image of the country and its president may fall even further. Western-style democracy may not appeal to all Ukrainians, but the majority (74%) interviewed before the protests said democracy is important for development. Few at the time were satisfied with the way it was working in their country.